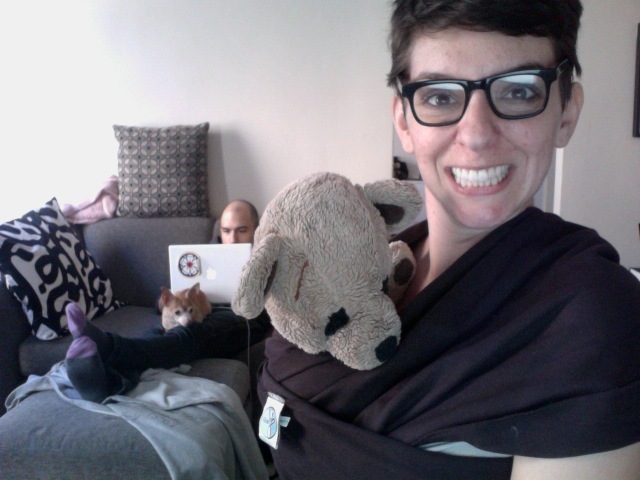 K and Mr. Bear try out our new Moby wrap. In the wider scheme of things, K and I are one of the few folks we know, our age, who are having a child. This being New York, your late twenties is just not right to be building a family. But we’re all about breaking the mold. And, lucky for us, we’re not the only ones in our wide circle of friends who are entering parenthood. A few friends of ours recently gave birth to young, strapping boys. And since all our apartments are small, our friends want to get rid of the stuff their kids have outgrown – which means free stuff for us. I guess I never realized the incredible movement of clothing, beds, and devices from one baby generation to the next. Over the weekend, we picked up more clothes and a co-sleeper from a friend. The weekend before that, a car seat; the weekend before that, more clothes. We’re stocking up and it feels oh so good. Another plus for us is that the newborn boys we met are incredibly HUGGEEE. On the growth charts, they are all at the 120 percentile – they’re toddler sized, driving cars, going to college – it’s wild. Our friends had to switch into new wardrobes which means their little guys were unable to wear quite a bit of their clothing. That’s great for us because we’ve been given entire stockpiles of normal sized, completely unworn, clothing. And this has led my daily prayers into a new direction. Besides my usual prayers for a safe pregnancy and a happy, healthy baby, I’m also praying for a NORMAL sized kidling. And if he wants to be a little small and grow into his new clothing, I’m okay with that too.